Context: Pennisetum alopecuroides (Poaceae) is a grass predominantly distributed in tropics and sub tropics. It is used as a cattle feed in many regions. Aim: The objective of the present study was to investigate the in vitro free radical scavenging and antiproliferative activity of ethanol extract of P. alopecuroides (EEPA) on cultured A549 human lung cancer cell lines. Settings and Design: The anti-oxidant activity of ethanol extract was evaluated at dose level 12.5, 25, 50, 100, and 200 μg/ml. The in vitro antiproliferative activity was measured at doses of 10, 50, and 100 μg/ml. Materials and Methods: The free radical scavenging activity of the EEPA was determined by 2,2-Diphenyl-1-picrylhydrazyl (DPPH) method and in vitro antiproliferative activity on A549 human lung cancer cells was conducted by using MTT assay method. Results: The phytochemical screening revealed that the P. alopecuroides contained alkaloids, tannins, saponins, and flavonoids as the major secondary metabolites. The IC 50 value of DPPH scavenging activity was found to be 44.41 μg/ml and 31.02 μg/ml for a mixture of EEPA and standard ascorbic acid, respectively. In vitro MTT assay showed that EEPA had anti-proliferation effects on A549 cells in a dose dependent manner. Conclusions: This is the 1 st time a pharmacological exploration of P. alopecuroides grasses has been conducted. We have shown that P. alopecuroides exhibits good free radical scavenging and strong in vitro cytotoxic activities against human lung cancer cell lines. The free radicals generated in the cells, upon accumulation, react with macromolecules like lipids, proteins and nucleic acids, and damage cellular functions. Moreover, oxidative damage to the cellular components results in alteration of the membrane properties such as fluidity, ion transport, enzyme activities, and protein cross-linking, eventually resulting in cell death. Phytochemicals containing anti-oxidant properties showed capacity to inhibit carcinogenesis. , Pennisetum alopecuroides (Poaceae) is a grass predominantly distributed in tropics and sub tropics and used extensively in cattle feed. It is also known as an ornamental grass often used for its radiating, fine-textured effect in the landscape. They usually remain attractive well into the winter, the leaves turning bright golden-yellow in the fall. This genus is predominantly distributed in tropics and sub tropics and used extensively in cattle feed. It has been noted that it's another species, Pennisetum spicatum has been traditionally used in treating heart diseases, as aphrodisiac in women, tonic, and as an appetizer. Previously our research group synthesized a series of novel 5-[(2E)-1- (1H-benzimidazol-2-yl)-3-substituted phenylprop-2-en-1-ylidene] pyrimidine-2, 4, 6 (1H, 3H, 5H)-triones and evaluated their antitumor activity against Dalton's ascitic lymphoma in mice. A careful survey of the literature revealed that no study of chemopreventive activity has so far been conducted on this plant. The present paper deals with the evaluation of in vitro anti-oxidant and antiproliferative activity of ethanol extract of P. alopecuroides (EEPA). The whole plant P. alopecuroides were collected in June 2013 from Palakkad district, Kerala, and authenticated by Dr. K. R. Leena, the botanist from Department of Botany, Government Victoria College, Palakkad, Kerala, India. A549 lung cancer cell lines were purchased from National Centre for Cell Science Pune was maintained in Dulbecco's Modified Eagles Media (HiMedia) supplemented with 10% fetal bovine serum (invitrogen) and grown to confluency at 37° in 5% CO 2 (NBS, Eppendorf, Germany) in a humidified atmosphere in a CO 2 incubator. The cells were trypsinized with a composition of 100 μl of 0.025% trypsin in phosphate buffer saline (PBS)/0.5 mM EDTA solution (HiMedia) for 2 min and passaged to 24 well plates in aseptic conditions. Extracts were added to grown cells at a concentration of 10 μg, 50 μg and 100 μg from a stock of 10 mg/ml and incubated for 24 h. The percentage difference in viability was determined by standard MTT assay after 24 h of incubation. The phytochemical screening test showed that EEPA contained several potentially active secondary metabolites [Table 1]. The presence of flavonoidal content in the EEPA aimed to evaluate the anti-oxidant and cytotoxic properties of the plant. Majority of the phenolic class of flavonoids exhibited their anticancer property by free radical scavenging ability. The anti-oxidant activity of the EEPA was determined by DPPH method. Anti-oxidants react with DPPH and reduce it to DPPH-H and as consequence the absorbance decreases. The degree of discoloration indicates the scavenging potential of the anti-oxidant compounds or extracts in terms of hydrogen donating ability. 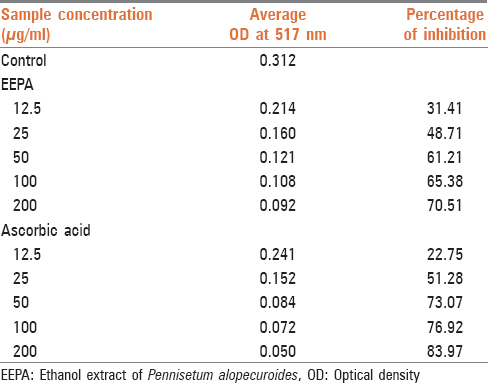 The anti-oxidant efficiency of EEPA is shown in [Table 2]. The IC 50 value of DPPH scavenging was found to be 44.41 μg/ml and 31.02 μg/ml of EEPA and standard ascorbic acid, respectively. In vitro antiproliferative activity on A549 human lung cancer cell was undertaken using MTT assay method which showed that EEPA had obvious anti-proliferation effects on A549 cells in a dose dependent manner [Table 3]. The sample showed considerable toxicity only at higher concentration and IC 50 values will be approximately 100 μg/ml. Morphological analysis showed slight variation from untreated control. Morphological changes in A549 human lung cancer cells were observed under an inverted microscope. Cells were treated with various concentrations of EEPA (10, 50, and 100 μg/ml) and examined as compared to control group. The untreated cells served as the negative control. The morphological changes of the cells were observed under the normal inverted microscope 48 h after-treatment. Treated group showed significant decrease in adherent cells which accompanied an increase in floating cells in culture medium. This study also showed that the EEPA treated A549 cells acquired a round and shrunken shape significantly in contrast to normal polyclonal structure of normal cells [Figure 1]. In the present investigation, EEPA recorded a consider amount of flavonoid and alkaloidal content. DPPH is a stable free radical that possesses a characteristic absorption maximum at 517 nm, which is diminished in the presence of an anti-oxidant compound capable of reducing it to its hydrazine form by hydrogen/electron donation. The strong scavenging capacity of EEPA on DPPH might possibly be due to the phenolic nature of flavonoid content which could act as a hydrogen donor. The cytotoxicity of EEPA can be related to the anti-oxidant activity and synergistic effect of multiple components in the extract. This is the first attempt of the pharmacological exploration of P. alopecuroides. The crude EEPA was found to exert a strong in vitro cytotoxic activity against human lung cancer cell lines and certainly merits further study to isolate the potentially promising bioactive components. Further studies are needed to identify the unknown anti-oxidant and cytotoxic secondary metabolites present in the plant material to establish their pharmacological properties. The authors are highly thankful to the Biogenix Research Center, Thiruvananthapuram, Kerala, India for help in carrying out the in vitro antiproliferative activity. Our sincere thanks also goes to Grace College of Pharmacy, Palakkad, Kerala for their support in this research work. Abraham DJ. Burger's Medicinal Chemistry and Drug Discovery-chemotherapeutic Agents. Hoboken NJ: Wiley, Interscience; 2003. p. 2. Bradford PG, Awad AB. Phytosterols as anticancer compounds. Mol Nutr Food Res 2007;51:161-70. Johnson IT. Plant anticarcinogens. Eur J Cancer Prev 1997;6:515-7. Brewer MS. Natural antioxidants: Sources, compounds, mechanisms of action and potential applications. Compr Rev Food Sci F 2011;10:221-47. Alinezhad H, Baharfar R, Zare M, Azimi R, Nabavi SF, Nabavi SM. Biological activities of ethyl acetate extract of different parts of Hyssopus angustifolius. Pharm Biol 2012;50:1062-6. Chauhan V, Chauhan A. Oxidative stress in Alzheimer's disease. Pathophysiology 2006;13:195-208. Wang S, Meckling KA, Marcone MF, Kakuda Y, Tsao R. Can phytochemical antioxidant rich foods act as anti-cancer agents? Food Res Int 2011;44:2545-54. Firdaus M, Prihanto AA, Nurdiani R. Antioxidant and cytotoxic activity of Acanthus ilicifolius flower. Asian Pac J Trop Biomed 2013;3:17-21. Kritikar KR, Basu BD. Indian Medicinal Plants. 2 nd ed., Vol. IV. New Delhi: Sri Satguru Publication; 1990. p. 2708. Mathew B, Suresh J, Anbazhagan S. Antitumor Activity of 5-[(2E)-1-(1H-benzimidazol-2-yl)-3-substituted phenylprop-2-en-1-ylidene] pyrimidine-2, 4, 6(1H, 3H, 5H) triones against Dalton's Ascitic Lymphoma in mice. Med Chem Res 2013;22:3911-7. Zhishen J, Mengcheng T, Jianming W. The determination of flavonoid contents in mulberry and their scavenging effects on super oxide radicals. Food Chem 1999;64:555-9. Sajeesh T, Arunachalam K, Parimelazhagan T. Antioxidant and antipyretic studies on Pothos scandens L. Asian Pac J Trop Med 2011;4:889-99. Senthilkumar R, Parimelazhagan T, Chaurasia OP, Srivastava RB. Free radical scavenging property and antiproliferative activity of Rhodiola imbricata Edgew extracts in HT-29 human colon cancer cells. Asian Pac J Trop Med 2013;6:11-9. Arung ET, Shimizu K, Kondo R. Inhibitory effect of isoprenoid-substituted flavonoids isolated from Artocarpus heterophyllus on melanin biosynthesis. Planta Med 2006;72:847-50. Zhong LR, Chen X, Wei KM. Radix tetrastigma hemsleyani flavone induces apoptosis in human lung carcinoma a549 cells by modulating the MAPK pathway. Asian Pac J Cancer Prev 2013;14:5983-7. Samarghandian S, Borji A, Farahmand SK, Afshari R, Davoodi S. Crocus sativus L. (saffron) stigma aqueous extract induces apoptosis in alveolar human lung cancer cells through caspase-dependent pathways activation. Biomed Res Int 2013;2013:417928. De Petris L, Crinò L, Scagliotti GV, Gridelli C, Galetta D, Metro G, et al. Treatment of advanced non-small cell lung cancer. Ann Oncol 2006;17 Suppl 2:ii36-41. Mishra BB, Tiwari VK. Natural products: An evolving role in future drug discovery. Eur J Med Chem 2011;46:4769-807. Mondal S, Bandyopadhyay S, Ghosh MK, Mukhopadhyay S, Roy S, Mandal C. Natural products: Promising resources for cancer drug discovery. Anticancer Agents Med Chem 2012;12:49-75. Mayakrishnan V, Veluswamy S, Sundaram KS, Kannappan P, Abdullah N. Free radical scavenging potential of Lagenaria siceraria (Molina) Standl fruits extract. Asian Pac J Trop Med 2013;6:20-6.